There are many variables used to develop an estimate of exterior house painting. Once you have a basic understanding of the process, you'll be able to generate a better budget and plan for contingencies. You'll also have to rent a paint sprayer, buy paint and other supplies, and, if it's a two-story structure, rent scaffolding. Experts agree that climbing on a ladder for finishing the second story might be too dangerous for many novice painters. This is not a job to tackle yourself simply to save money, because once you assess the value of your time, skill, and the purchase of materials you don't have on hand, you may find it's easier and faster to use a professional. Evaluate your comfort level on this type of home improvement, and decide from there. However, if you want to split the difference, many pros recommend hiring them for the "dirty work" of cleaning, scraping, and caulking, and then painting the home yourself. Get a variety of quotes. 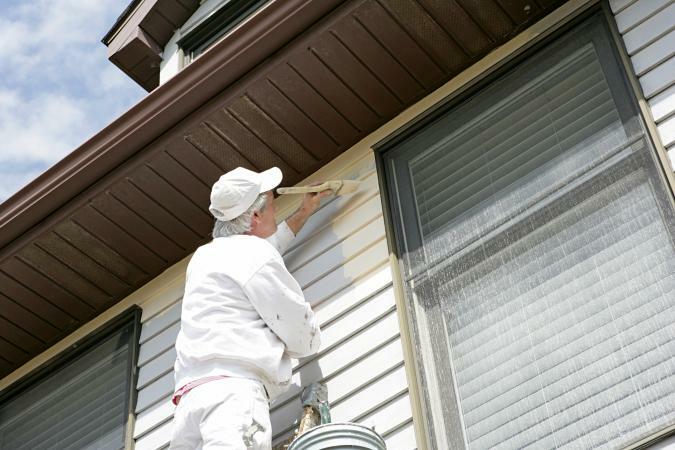 Experts recommend that you get at least three estimates of exterior house painting in writing. Ask for quotes from bonded and insured painting professionals, general contractors, and handymen. If you live in a larger community, opt for at least five projections. Request references. Ask for two or three other clients you can call or visit to see the work firsthand. Also check with the Better Business Bureau to make sure complaints haven't been lodged against the contractor. Ask for off-season or fill-in rates. Fall is usually the best time for reduced rates, because crews are less busy then. Some professionals may also be able to complete your job while waiting for a larger project. If this aspect is fine with you, just make sure to get assurance in writing as to when the job will be done and within what timeframe. Review the materials list. Use this to cross-check materials at hardware and home improvement stores and to verify you're getting what you pay for in the end. Factor in repairs. Painters come across any number of issues on a home, including termite damage, bees' nests, and rotting windowsills. Talk with the contractor up front to determine what should be done if these situations occur. Determine who buys the paint. If your home falls within historical or neighborhood covenant guidelines, talk with your contractor about whether you should purchase paint or if the company has resources that can help. It's hard to generalize what an estimate of exterior house painting might be city to city. However, if you want some basic numbers to start with, consider that a paint job for a common two-story home, with prep and painting, will average about $2,500 to $3,000. This is a very rough projection, but it gives you a base price on which to build your budget. Get an idea of how much exterior paint is needed by using the calculator in the Kelly Moore Paints app. Many contractors now use the power of the Internet to advertise their services. Here are just a few sites that allow you to plug in information in order to receive a general estimation for budget purposes and to connect with professionals in your area.